On April 27, 1887 the report of the Railroad Commissioners regarding the Roslindale disaster on the Boston & Providence Railroad was presented to the Senate. After reviewing the history of the accident and also of the road at length, the Commissioners make the following arguments: It appeared that A.A. Folsom, the Superintendent of the Road, and the Superintendent of Construction, George F. Folsom, knew that the bridge was being built partly at the Trenton Iron and Steel Company’s works and partly at the Phoenix Bridge Company’s works, but that they never inquired about the standing or even the existence of the Metropolitan Bridge Company, and knew only and looked only to Mr. Hewins for responsibility in the matter. They had known him previously as Engineer for the Moseley Iron Works at Readville, and his bearing impressed them as that of an able and upright man. A.A. Folsom, the Superintendent of the Road, also testified that he made inquiry of one man, now dead, in regard to Mr. Hewins, and received a favorable report, and thinks he may have inquired of one or two others. The main tension members of the bridge were made at the Phoenix Iron Works, and were of excellent workmanship and apparently of good material. The rest of the bridge was made at the Trenton Iron and Steel Company’s works, also a reputable company; but it appeared that the work there was done, not under the superintendence of the officers of the company, but under the superintendence of an agent of Mr. Hewins, the iron company furnishing only the iron, the workmen and the tools, so that the company did not and does not consider itself responsible for the quality of the iron or the workmanship. Moreover, George F. Folsom, the Superintendent of Construction, testified that since 1861 he had had charge of the construction and repairs of buildings and of bridges, that for ten years previous to that date he had worked as a machinist in the shops of the company, that up to the time of his appointment as Superintendent he had had no practical experience in bridge building, that his first experience in iron bridge building was in connection with these trusses in the Bussey Bridge, that he was at the bridge but little while the construction was going on, that he had other business to attend to, and that he trusted wholly to Mr. Hewins to build the bridge properly and put it up in proper shape. It further appears that the railroad company employed no expert to pass either upon the original design of the bridge, or upon the bridge after it was constructed, and, in fact, consulted nobody in regard to it. If the management of the railroad had taken the trouble to make inquiry, it would have learned that the company which Mr. Hewins professed to represent did not in fact exist, and that not only the design but also the quality of the materials and workmanship of the bridge depended solely upon his ability, honesty and faithfulness. As a matter of fact, the material and workmanship of the compression members appear to have been sufficiently good. The design in many of its details proved to be bad. Such a way of doing business would be lax in a purely commercial transaction. In contracting for and constructing a bridge, in dealing with a matter involving the safety of life, it was culpable. Walter E. White, the engineer, testified that he had about ninety pounds of steam and worked steam with the throttle open two or three notches all the time after leaving Roslindale, but that he had not, in his opinion, acquired a speed of about more than fifteen miles an hour because the air brakes came off slowly and retarded the train. The condition of the wreck indicated that the train must have been going considerably faster than the engineer supposed. The experts generally placed the rate at thirty miles an hour or more. The engineer had served in that capacity on the Dedham branch for more than thirty years. He knew that the rules limited the speed on the old bridge to twelve miles an hour, and thought that the same rule applied to the new bridge. The Superintendent of the Road subsequently testified that the limitation as to speed had been removed after the bridge was rebuilt in 1876 and he submitted a printed copy of the present “rules and regulations,” the second and last edition of which was issued in 1881. It often happens that an employee of long standing blindly follows routine and loses sight of the reason or authority which established the practice. This may be a source of danger, and should be guarded against. The engineer showed that he was a man who would tell what he believed to be the truth, no matter how disastrous the consequences might be to himself. The theory that the disaster was due to a derailment of the train received no sufficient confirmation. On the contrary, the fact was abundantly established by the evidence that neither the ties on the embankment south of the bridge nor those on the south half of the bridge itself showed any signs of derailment. If a derailment occurred it must have occurred within a few feet of the joint-block at the north end of the Hewins truss. A theory was also started at the investigation that the disaster might have been caused by the dropping of a brake beam between the ties, but the theory was not supported by the necessary evidence. If a brake beam dropped at all it must have dropped within a few feet of the hangers. A speed of fifteen miles an hour is equivalent to about twenty-two feet a second; of twenty miles an hour, to about twenty-nine feet a second; of thirty miles an hour, to about forty-four feet a second. A cannon ball falls sixteen feet the first second. The length of a car is about fifty feet. The evidence shows that there has been considerable anxiety on the part of passengers in regard to the safety of this bridge, and in various ways and at various times this anxiety has been brought to the attention of the management of the road. Though in some cases this anxiety was caused by the discovery of loose nuts on the Parker truss, it was generally a vague fear, founded on no known defect in the bridge, but apparently largely due to the skew of the bridge and to the fact that the track on both sides of the bridge ran on high embankments. 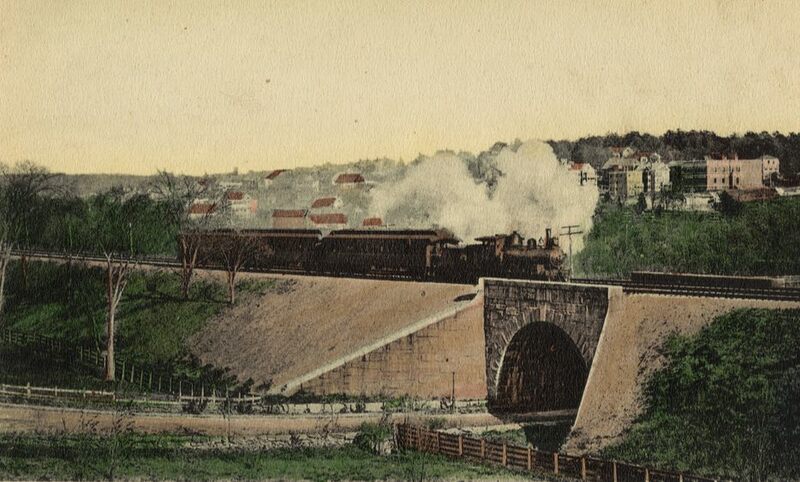 In December, 1881, the Board of Railroad Commissioners wrote to the Superintendent of the Boston & Providence Railroad in relation to this bridge. It appeared in evidence that shortly after the receipt of this letter a test of the bridge was made, but no record of such test was returned to the board, nor was the test followed by a series of tests, which the letter of the board indicated was necessary in order to show conclusively whether the bridge was maintaining its strength. It appeared that examinations of the bridge had been made every spring and fall by George F. Folsom, the Superintendent of Construction, and he described fully his method of going through the bridge and examining its details. He testified that he had detected no fault in the construction of the bridge, except that it would be better if made of fewer pieces; that he never had any anxiety about any portion of the bridge that was covered up; that he did not know how the floor-beams under the joint-blocks at the ends of the truss were supported, but supposed that they were supported on iron stirrup straps, which he thought were one and a half-inch square; that he could not examine these stirrup straps, and never thought they were an important feature of the bridge until he saw them lying on the ground. Such was the examination made by the Superintendent of Construction to ensure the safety of passengers riding over that bridge. The hangers held up the floor beams. When the floor beams fell the floor system would fall, and yet it never occurred to the man who was supposed to have superintended the construction of the bridge, and to whom was entrusted the examination of the bridge every spring and fall, it never occurred to him that the strength and condition of these hangers was vital, and should have been an important feature in his examination. Moreover, he did not know how the hangers were made, his supposition in regard to their shape and size was incorrect, and he did not have, nor did the road have, any drawings showing their construction and dimensions. It is a defect in any bridge if a vital part, no matter what excess strength it may have, is unnecessarily covered so that it cannot be inspected. In this bridge not only was a vital part unnecessarily covered, but no one in the employment of the corporation knew anything about its construction or its strength, and, as a matter of fact, it was so constructed as to be sure to weaken under continued use and was insufficient to do its work with safety, even had it been so placed as to be subject to full and constant inspection. Dear Sir – The ties on the Bussey Bridge all extended eighteen inches outside of rail on east side, and were all eighteen inches on centers. The short ties that butted against truss were seven feet five inches long; the ties at both ends of the bridge were ten feet long. The ties were six by ten and eight inches apart. Guard plank outside each rail ten inches wide and three inches thick covered bridge and abutments. It will be seen from this letter that the Superintendent of Construction states that the spaces between ties on this Bussey Bridge were eight inches. Mr. E.S. Philbrick, the expert employed by the road, and Mr. Thomas Doane, the expert employed by the commissioners, who took measurements of the ties and the spaces between them as they were found at the wreck, testify that the space between the ties on this bridge were from fifteen to eighteen inches, instead of eight inches as stated in the letter of the Superintendent of Construction. In spite, then, of the circular of 1881, and the letter of 1882, each of which called the attention of the Superintendent of the Boston & Providence Railroad to the importance of having ties on bridges laid closely together, the ties on this bridge remained unchanged, and at the time of the accident were so far apart that had a train been derailed upon that bridge, the destruction of the bridge would have been inevitable; the spaces between the ties were so great that the wheels would have sunk down between them and the bridge would have been wrenched and torn to pieces. Moreover, if a brake beam had fallen, it would, in all probability, have caught between the ties and wrecked the bridge. Neither the Superintendent of the Road nor the Superintendent of Construction would deny that the spaces between the ties on this bridge were too great. As it happened, the accident was not caused by defects of the system, but the management is none-the-less censurable for its long-continued neglect to remove this undoubted element of danger. The contract for the rebuilding of the bridge in 1876 was made without proper examination as to the standing of the contractor. Those who acted for the corporation in making the contract had not sufficient knowledge of iron bridge building to enable them to pass intelligently upon the design and specifications. The design and specifications for the bridge were not such as should have been accepted. The bridge was constructed practically without superintendence on the part of the corporation, and the corporation neglected to preserve a copy of the specifications, drawings and strain sheets. The tests of the bridge were not made in the presence of anyone acting for the corporation who was qualified to judge of their value. From the time of the construction of the bridge to the day when it fell the railroad company had caused it to be examined by one man only, who, year after year, passed over vital parts of the bridge without realizing that they were of importance. This man had been in the employment of the corporation for a long series of years, his trade was that of a machinist, he had not been educated as a Civil Engineer, and the management had abundant reason to know that he was not qualified, and had had no opportunity to qualify himself to do the work assigned to him with reference to this bridge. The series of tests of the bridge recommended by the board in 1881 was not made. Notwithstanding the repeated warnings of the board, the spaces between the ties on this bridge were far too great for safety; and, notwithstanding the recommendation of the board in 1881, no suitable guardrails or guard timbers were placed upon the bridge. The Westinghouse automatic air brake, a safety appliance, remarkable alike for its simplicity and effectiveness, and long ago approved and adopted by all leading railroads, was not in practical operation on this train; neither was the train furnished with a sufficient number of brakemen to comply with the requirements of the statute. The disaster and the facts which have been disclosed impose a grave responsibility on the Board of Directors. It is their duty, by the most searching inquiry, to ascertain forthwith whether any other work has been done in a like negligent and incompetent manner, whether in other matters reasonable and well-proved precautions against accidents have been ignored or neglected and whether false economy has been practiced and safety sacrificed. They should not rest until they have taken the most energetic measures, without regard to expense and without regard to persons, to correct the past and to ensure better and safer management in the future. So far as relates to bridges the Directors have already caused a thorough expert examination to be begun. Fortunately there are but few bridges on the line. In mitigation of the sentence of condemnation called for by the foregoing findings and in support of the hope that the history of the Bussey Bridge is exceptional, it must be remembered that from 1869, when the Board of Railroad Commissioners was created, up to the time of this disaster, a period of eighteen years, there has been no train accident on the Boston & Providence Railroad which resulted in the loss of life, or even in serious injury to a passenger. The accident furnishes another proof of the necessity of abolishing the deadly car stove. As bridges embody many possibilities of danger, it is proper that special means should be taken to secure careful, competent and faithful construction, and a thorough and scientific examination of them by the railroads at regular intervals, followed by a thorough State inspection. The importance of such action is emphasized by the fact that the weight of engines and of the rolling stock of railroads and of the loads carried has been increasing for many years. The weight of engines and rolling stock has doubled within twenty years. Moreover, the speed of the heavy passenger express and through freight trains has also largely increased. The examination made by the Board of Commissioners can at best be but cursory. There are over a thousand bridges in the State, and no member of the board, no matter what his scientific education may be, can, in addition to his other duties as Commissioner, make anything but a brief, partial and unsatisfactory examination of them. A proper inspection in behalf of the State would require practically the whole time of a bridge expert. The board recommends the passage of an act requiring every railroad, at least once in two years, to have a thorough examination of all bridges on its lines made by a competent and experienced Civil Engineer, who shall report in writing to the corporation and to the Board of Railroad Commissioners the results of his examination, his conclusions and recommendations. The reports should embrace such information in relation to the history and construction of each bridge, including detail drawings and strain sheets, as may be called for by the Board of Railroad Commissioners, and said board should be authorized to employ a competent expert to examine such reports and make such further examination of the bridge structures as may be deemed necessary or expedient.